Safety Belt is used for working on transmission line. 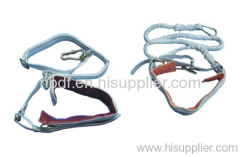 The set include the belt, rope and connectors for protection the safety of working people on transmission line. Safety belt is used for the operator to work on overhead transmission line or tower. It is made of high strength polyamide. Group of Safety Belt has been presented above, want more	Safety Belt and Safety Belts, Please Contact Us.